..... but now only the occasional day has snow, and the snowfalls are changing to rain, the winds are still cold and strong but once in a while the sweet promise of a warmer wind mixes in ......... Ah, Spring begins to stir the earth again! While the winter hung on I knit and read and took a few pictures ........ I bought a spindle and some rovings ........ the lady that I bought the items from gave me a hugh handful of fleece to 'practice with' ........ which was very nice of her. I haven't practiced yet .......... but I've bought myself a couple of books that should help ............. Spin It by Lee Raven, and Start Spinning by Maggie Casey. And, Heather and I bought some livestock last month and became 'farmers' ....... or would we be 'shepherdess?' 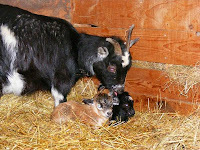 We bought a pair of Pygmy goats ......... a breeding pair ....... and Annie, the Nanny was pregnant. Note that I said 'was' ................ A week and a half ago we were blessed with two doe kids .............. so now I'm buying hay and Hobby Farms Magazine. All are doing well ....... lively and healthy ....... promising much fun for the weeks ahead. I love pygmy goats. I had a retired ram I wethered - he was a lot of fun. You'll really enjoy those kids! Oh Dawn, they are adorable!